The layer-by-layer (LbL) deposition technique is a versatile approach for preparing nanoscale multimaterial films: the fabrication of multicomposite films by the LbL procedure allows the combination of literally hundreds of different materials with nanometer thickness in a single device to obtain novel or superior performance. In the last 15 years the LbL technique has seen considerable developments and has now reached a point where it is beginning to find applications in bioengineering and biomedical engineering. 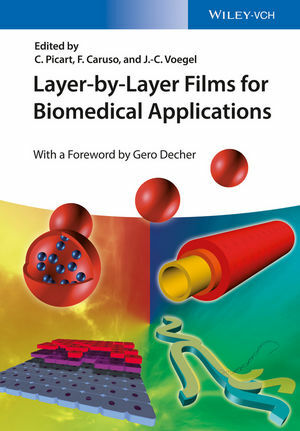 The book gives a thorough overview of applications of the LbL technique in the context of bioengineering and biomedical engineering where the last years have witnessed tremendous progress. The first part familiarizes the reader with the specifics of cell-film interactions that need to be taken into account for successful application of the LbL method in biological environments. The second part focuses on LbL-derived small drug delivery systems and antibacterial agents, and the third part covers nano- and microcapsules as drug carriers and biosensors. The fourth and last part focuses on larger-scale biomedical applications of the LbL method such as engineered tissues and implant coatings. Frank Caruso is a Professor in the Department of Chemical and Biomolecular Engineering at the University of Melbourne, Australia. He was awarded an Australian Research Council Laureate Fellowship 2012 for recognition of his significant leadership and mentoring role in building Australia's internationally competitive research capacity. He has published over 350 peer-reviewed papers and is on ISI's most highly cited list, ranking in the top 20 worldwide in materials science in 2011. Frank Caruso is also included in Thomson Reuters' 2014 World's Most influential scientific minds. He was elected a Fellow of the Australian Academy of Science in 2009. Prof. Caruso is also the recipient of the inaugural 2012 ACS Nano Lectureship Award (Asia/Pacific) from the American Chemical Society for global impact in nanoscience and nanotechnology, the 2013 Australian Museum CSIRO Eureka Prize for Scientific Leadership, and the 2014 Victoria Prize for Science and Innovation. His research interests focus on developing advanced nano- and biomaterials for biotechnology and medicine. Jean-Claude Voegel was until end of 2012 head of the INSERM (French National Institute for Health and Medical Research) research unit "Biomaterials and Tissue Engineering" at the University of Strasbourg, France. His scientific activities were based on a research project going from fundamental developments to clinical applications, the preparation of materials and modification of biomaterial surfaces using functionalized architectures mainly prepared with the aid of polyelectrolyte multilayers obtained by the LbL technology. Jean-Claude Voegel published more than 130 papers in high-impact factor journals in the last decade around these projects and belongs to the top scientists in chemistry and materials science in terms of citations in this field.